Unterkunft wird gerade frisch renoviert - dann wird es auch eine Küche und Frühstück geben. Bis dahin sehr einfach aber sauber - leider kein Tisch auf dem Zimmer. Kleine Bar im EG. Sehr freundlicher, persönlicher und engagierter Manager, guter Tipp für ein Frühstück am Morgen. Zu empfehlen für Durchreisende und Monteure. Where to find Gondelsheim hotels near an airport? Where can I find hotels in Gondelsheim that are near tourist attractions? Visiting Rhine - Neckar? 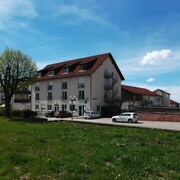 Would you like to stay somewhere near the downtown area of Gondelsheim? 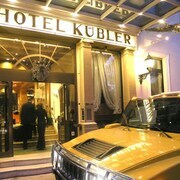 You'll find 2 Expedia-listed hotels and apartments within a 0.1-kilometre (0.06-mile) distance of the heart of town. Expedia-listed hotels that are within driving distance of Gondelsheim include the ACHAT Comfort Bretten and Hotel Scheffelhöhe. The Hotel Restaurant Erbprinz can be found 20 kilometres (13 miles) from the center of Gondelsheim. Or, alternatively, the Astralis Hotel Domizil can be found 30 kilometres (17 miles) away. 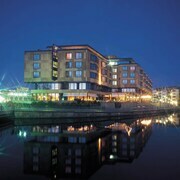 Two more options are the Ringhotel Mönchs Waldhotel and the Best Western Plus Palatin Kongresshotel. 40 kilometres (24 miles) away from Gondelsheim you'll find Heidelberg, where you can spend the day enjoying Heidelberg Castle and Thingplatz. If you'd like to spend a night or two in Heidelberg, check out the Boutiquehotel Heidelberg Suites - Small Luxury Hotels and Hotel Europäischer Hof Heidelberg. 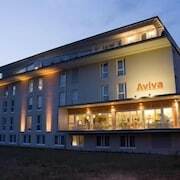 Or, you could stay in Heilbronn, 45 kilometres (27 miles) to the east of Gondelsheim, where you can choose from the Best Western Hotel Am Kastell and Vienna House Easy Neckarsulm. While visiting Heilbronn, a couple of sights worth adding to your itinerary are the Heilbronn Deutschhof and Experimenta Heilbronn. If enjoying sport is your passion, take the time to visit Mercedes-Benz Arena, which is 50 kilometres (33 miles) to the southeast of Gondelsheim. 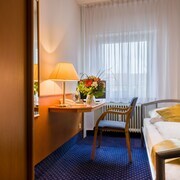 Sports fans wanting to find a room or apartment near to the sporting action can select from the Le Méridien Stuttgart or the Waldhotel Stuttgart. Stuttgart Central Station Airport is a logical airport, and is located 50 kilometres (31 miles) from Gondelsheim. Nearby accommodation options include Althoff Hotel am Schlossgarten and Steigenberger Graf Zeppelin. What are the most popular Gondelsheim hotels? Are there hotels in other cities near Gondelsheim? What other types of accommodations are available in Gondelsheim? Explore Gondelsheim with Expedia.ca’s Travel Guides to find the best flights, cars, holiday packages and more!